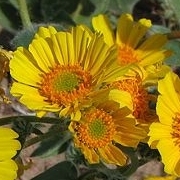 Here are photographs from my California desert wildflower tour from March 7 to 10, 2005. The photos are organized into albums according to location; select from the shortcuts at left or the links below. A mild El Nino weather event began in summer of 2004 and set the stage for a wet winter in California. Early strong storms surprised us in October, and were followed by regular soaking rains. The rains reached biblical proportions in southern California in January and February. Many areas had record rainfall, including both the coast and desert. Warm spells in between storms germinated seeds that had been lying dormant for years, awaiting a wet winter. 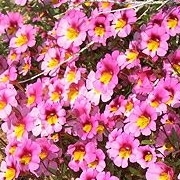 Reports began to appear in February of excellent flower displays beginning in the deserts. In response, my wife Karen and I scheduled a trip to tour the California deserts from March 7 to 10, 2005. We were simply amazed at the extent and variety of wildflowers that we saw! 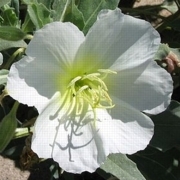 And the season was just starting, with blooms mostly in the lower elevation deserts. No doubt the middle and higher areas would be blooming profusely later in the spring. I took hundreds of photographs in our rapid tour, starting at Anza-Borrego State Park in the south, and proceeding north through Joshua Tree National Park, Mojave National Preserve, Death Valley National Park, and then through Red Rock Canyon State Park in the west on the way home. We saw awesome carpets of wildflowers and delightful surprises of rarely seen species. While driving on the highway, the desert appeared generally green (unusual in itself) with only spots of color here and there. But whenever we stopped and walked around a bit, we were always amazed at the number and variety of flowers growing in and among the bushes and boulders. 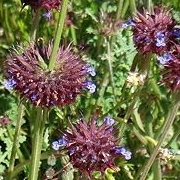 2005 has been an exceptionally good year for wildflowers in Anza-Borrego. But Anza-Borrego is generally a reliable place for wildflowers, as are Joshua Tree and Red Rock Canyon (which were just starting to bloom on our trip). We have been treated to good flower displays in all three of those parks on trips of previous years. The real surprise and show was in Death Valley, normally the driest place in North America with scanty spring flowers. Fields of desert gold sunflowers covered thousands of acres in the southern part of Death Valley during our visit, and the northern sections were beginning to flower as well. In addition, the all-time record rainfall in Death Valley (over 6 inches where normally less than 2 is recorded annually) had re-created a large but shallow Lake Manly in the Badwater basin which is normally a dry lake of extensive salt flats. The combination of flowers, shining lake, and desolate multi-colored rocky mountains (some topped with snow from recent storms) was truly other-worldly and awe inspiring. The day we spent in Death Valley was worth the entire trip and is an event to be remembered - perhaps not to be repeated in our lifetime. This web site is a collection of my best photos from our trip, organized by location. I have tried to identify the flower species in each photo, but I claim no expertise in this area. My identifications are based on the excellent wildflower brochures produced by the Anza-Borrego Institute and the Death Valley Natural History Association, and available in the respective park visitor centers for only one dollar. Other useful online identification resources are listed below.